I must confess to never having seen director Joseph Losey's mid-career debacles (or masterpieces; depends on whose take you listen to) Modesty Blaise (1966) or Boom! (1968), but judging from what I've read and heard regarding those films, Losey -- an expat American who fled McCarthyism in the '50s and made an unusually varied string of films in the U.K. and Europe over the subsequent decades -- had an ability and a willingness to go over the top not quite hinted at by, say, his more widely-respected collaborations with playwright Harold Pinter (as in 1963's The Servant). "Operatic" is, among other things, a synonym for "over-the-top," and so I half-expected something rococo, a subversion or a lark -- maybe along the lines of Ken Russell's playfully grotesque, hyper-modern classical-music extravaganzas -- from Losey's late-career Don Giovanni (1979). But (and this is probably for the best), it's actually a faithful and straightforward, albeit highly intelligent and ravishingly cinematic, movie version of Mozart's beloved 18th-century opera. 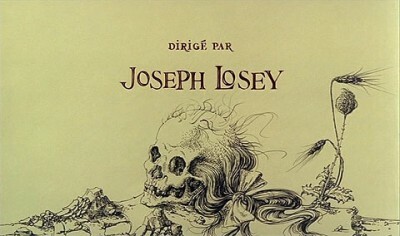 Losey undertook quite the international cinematic adventure to make his Don Giovanni: He obtained generous French funding; scouted eye-popping, authentic Italian locations; got renowned costumer and opera expert Franz Salieri to aid with the adaptation of the libretto and the look of the film; cast a handful of well-known and highly-regarded professional opera singers; and had the three-hour-long piece recorded by his cast with the Paris Opera, under the baton of the accomplished American conductor Lorin Maazel. He then brought the shoot to Venice and to Vicenza, on the Northeastern coast of Italy, for the shooting. 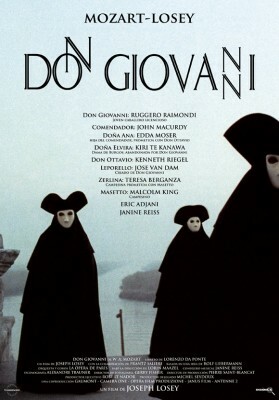 What resulted from all that large-scale yet intricate preparation is a gorgeously well-realized, worthy film version of Don Giovanni that maintains an aura of seeming effortlessness as it pulls off the considerable feat of translating everything entertaining, beautiful, and compelling about the opera into the language of the movies. In terms of cinematic storytelling, opening out an opera as Losey does here results in an experience whose characteristics are more or less familiar from many a movie musical. Exclusively through Mozart's superlative music (thankfully, no spoken dialogue has been added), rousingly played and accompanied by the often awe-inspiring vocalizing of Losey's cast of fine singers, the plot is unfolded: We hear Elvira's testimony (and Don Giovanni's disingenuous rebuttals) and are privy to her secret ambivalence over this irredeemably wicked man for whom she still carries a torch. We witness the stunned recognition of Donna Anna, crazed with grief, that her and her husband's host in the country is none other the seducer who nearly took her honor before killing her father. We follow the ever more complicated, funny, violent, ultimately tender ins and outs of Don Giovanni's attempts to pluck what he thinks is easy fruit, a peasant girl called Zelina (Teresa Berganza) from her hardy, handsome husband, Massetto (Malcolm King), as well as Giovanni's increasing recalcitrance and unrelenting, unrepentant pursuit of sexual conquest. All the while, the desire for vengeance on the part of Donna Anna and Don Ottavio, Donna Elvira, Zelina and Massetto, and the other peasant villagers around his lavish estate is building to a furious degree that will reach its consummation when, after Don Giovanni has made light of the grave of Donna Anna's late father and mockingly invited the dead-and-buried man to dinner in an attempt to show off for the frightened Leporello, the dead man, in the form of the eerily lifelike statue that marks his gave, shows up to put Don Giovanni in his place, which is someplace other -- lower, you might say -- than the heaven that this messenger of cosmic justice came from or the earth on which Don Giovanni has abused his privileged freedom and callously broken hearts for far too long. Losey's triumph here is the sheer, fresh, lively inspiration with which he follows through on his choice to be faithful to the opera in setting and tone. From the very beginning (in which Don Giovanni meets eyes and flirts with Donna Anna over the fiery work of glassblowers below, an infernal atmosphere/image brought deliciously full-circle at the end), the director takes full advantage of the many visual opportunities afforded by his authentic exterior and interior locations, not just to frame, capture, and present us with their beauty (though there are a few shots, several taken on the evening-sunlit waters around Vicenza and the one in which Don Giovanni's rapacious eyes fixate upon the image of a nubile teen bathing beauty, whose lighting and framing make them eye-pleasuring, painterly compositions, indeed), but to move through, physically rendering the feelings and plot dynamics, with all the performers and camera operators evidently under strict orders to move with the tempo of the music. This makes for some swooning, exquisitely graceful "musical" effects in the blocking and movement of scenes that could not be brought out on the stage, but only through the cinematic apparatus of which Losey here proves himself such a sensitive, restrained but agile master. 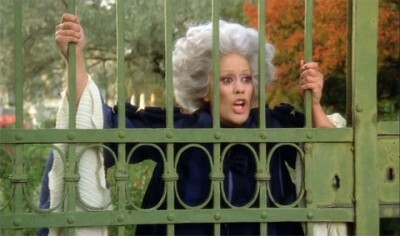 The film's baseline is, truth be told, the stage-like composition, wide-shot proscenium-arch framings that give us sumptuous, frieze-like views of the characters and their environs. But Losey (often through fairly impressive unbroken takes that "cut" from one figure/space to another through camera movement, not montage) is then always branching out or launching away from this stage-replicating type of image, and in unexpected, inventive ways, too -- panning off to the side to reframe the image to a surprising, evocative close-up, or creating frames within frames for a sometimes extreme, telescopic effect -- using space and movement to add yet another, purely filmic layer to Mozart's already-rich work for a bursting, bounteous, and gratifying experience that is alive and attuned to aesthetic possibilities at every level. 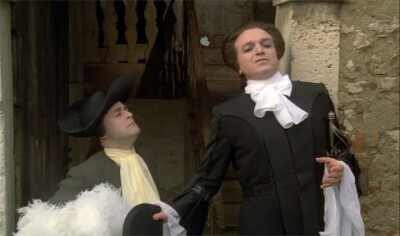 Don Giovanni is a visually and narratively sophisticated picture quite apart from its source material; it looks fruitfully back (the park-and-meadow exteriors as Donna Elvira roams the grounds create pastoral-melancholy tones noticeably similar to the ones Bergman sought for Cries and Whispers) while also anticipating the future: In a scene where Donna Anna, Don Ottavio, and Donna Elvira arrive to Don Giovanni's ball in disguise, the vivid threat to a sexual malingerer of cloaked and masked figures, right down to the details of what specific cloaks and masks are on display here, seems very much like something Kubrick could have borrowed for Eyes Wide Shut. One could argue that there's no real need to ever make a movie out of an opera, because every important sonic and visual dimension is already there and accounted for, complete and perfect, so well-established and long-admired over the centuries (undoubtedly so in the case of Don Giovanni, at least) that shoehorning them into another medium is a superfluous, foolhardy, or even disrespectful or tasteless act. But, granting the opera purist's insistence that no movie could ever replicate the immediacy and specific power of seeing it live (and above and beyond the important logistical and financial consideration that many more people have always had access to recordings and movies than to live opera, so a movie as well-done as this one is surely the right kind of intended popularization, through which a more rarefied art like opera has a real chance to reach far and wide), Losey's version makes for a striking example of how, instead of forcing some unholy, compromised union of opera and film, you can match the unique properties of the cinema to the musical and performative and visual greatness already there in a great opera to make the different media complement and enrich one another. There are certain qualities to any story that might only be brought out, or at least might best be brought out, through the movies' uncanny ability to focus and direct our gaze -- guiding and restricting it in one way, if you compare it to looking at everything onstage at once, but in another sense freeing it so that, as Losey allows us to do in, we may see more, and in different ways. It's a further range of distance, closeness, and shifting points of view that's only possible with a dextrously-handled camera; a well-guided cutting table; and the guiding vision of people like Losey and the collaborators with whom he created this beautiful, lovingly faithful yet zestfully cinematic rendition of Mozart's great opera -- film artists and artisans who know how to handle, coordinate, and maximize the artistic possibilities of their instruments as capably as anyone tuning a violin in an orchestra pit or singing on a stage. 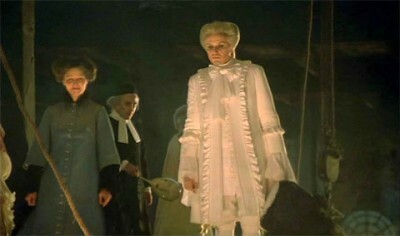 *"The old is dying and the new cannot be born; in this interregnum a great variety of morbid symptoms appear," among the latter of which the filmmakers presumably include the affluent, landed, noble-by-birth Don Giovanni. With thanks to reader Jeremy Gilliam for catching and bringing my attention to a date error I made in the originally posted review, which has now been corrected. The transfer (AVC/MPEG-4, 1080/24p) faithfully presents the film widescreen at its original aspect ratio of 1.66:1, and is overall very nice-looking, continuing Olive Films' streak of quite-good (but not-quite-great) transfers. The crispness and clarity of the image is excellent, as are the trueness and solidity of the colors (including in the many nighttime/dark scenes) and the naturalness of skin tones. There is also a healthy amount of celluloid texture to prove that nobody went on an over-scrubbing, grain-killing spree with the digital noise reduction (DNR); however, the DNR has probably been over-applied here and there at the expense of the picture quality being as natural and cinematic as possible, and there is also some intermittent edge enhancement with some occasionally noticeable haloing around human or structural edges in the picture (this is easier to discern with the home projector/large-screen setup used to watch the film for review; it's possible that these small and fleeting flaws would be even less noticeable on standard TV screens). Still, on balance, an overall very respectful and fairly conscientious job has been done with the image, and there's nothing very distracting in the relatively minor missteps to detract too significantly from the overall very high picture quality. 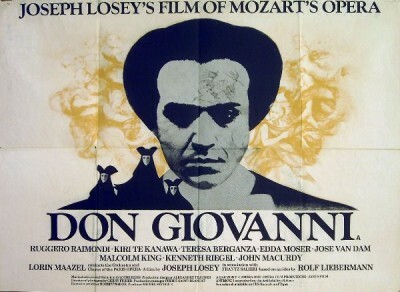 It's somewhat surprising that Joseph Losey's very nicely opened-out film version of Mozart's Don Giovanni doesn't have more of a solid, widespread reputation (I was familiar with Losey, but not with this late-career triumph); it's easy to imagine it as a standard, unassailable point of entry for contemporary audiences into the world of the great 18th-century composer. But now Olive Films' pulling it out of the vault and carefully dusting it off for Blu-ray (it makes for a nice companion, in the Olive studio-repertory catalog, to their release of Francesco Rosi's movie version of Carmen) is giving it another chance at familiarity and appreciation, and reappraisals should find it much newfound favor among cinephiles and classical-music buffs alike. 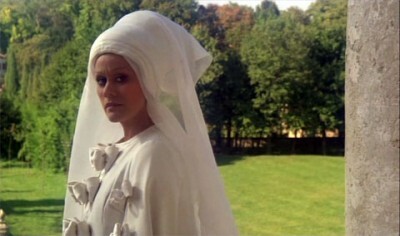 Losey's take on the opera is unexpectedly faithful (you could even call it "traditional") for a director more famous for iconoclastic art-house visions (The Servant, The Go-Between) or giddy, campy excess (Modesty Blaise, Boom! ); he cast the film with professional opera singers, adheres with high fidelity to the music/melodies by Mozart and libretto by Lorenzo da Ponte, and shot most of it in Venice and in Italy's gorgeous northeast to take advantage of the regions' well-preserved, authentic period architecture and grounds (it's a finely-wrought period film as well as a great adaptation). But it's a case of well-circumscribed boundaries leaving plenty of room within them for the artist to dig deep and work his magic, which in this case means Losey's presiding over the perfect marriage of careful, fluent cinematic technique and the famous operatic work; he doesn't touch its core elements at all (subversion, again, is in no way the aim here), but he uses the camera and then-innovative (still marvelous-sounding) Dolby technological advances in sound in such a way that we visually experience the story and the music on whole new, finely detailed visual and aural planes, thereby making his own contribution, actually adding something to a venerable and long-standing high-water mark of Western culture, reviving it with no disrespect and without compromising any of its effect. This is a film whose visual sensitivity and prowess, not to mention its dictionary-definition "classic" soundtrack, aren't fully appreciable in the old standard-definition media, and you feel grateful while watching it that it has finally had its rightful turn at a well-done high-definition upgrade. There's no reason not to introduce yourself to Don Giovanni via this film if you're as-yet unfamiliar, and nor is there any excuse for those who love Mozart and/or the cinema not to have this one high up on their short list of coveted titles that have finally made their way to a good high-def home. Highly Recommended.